Musician, composer, producer, arranger, and pioneering entrepreneur Quincy Jones has lived large and worked for five decades alongside the superstars of music and entertainment -- including Frank Sinatra, Michael Jackson, Steven Spielberg, Oprah Winfrey, Ray Charles, Will Smith, and dozens of others. 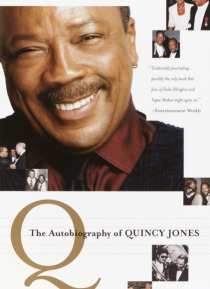 Q is his glittering and moving life story, told with the style, passion, and no-holds-barred hone… sty that are his trademarks.Quincy Jones grew up poor on the mean streets of Chicagos South Side, brushing against the law and feeling the pain of his mothers descent into madness. But when his father moved the family west to Seattle, he took up the trumpet and was literally saved by music. A prodigy, he played backup for Billie Holiday and toured the world with the Lionel Hampton Band before leaving his teens. Soon, though, he found his true calling, inaugurating a career whose highlights have included arranging albums for Frank Sinatra, Ray Charles, Dinah Washington, Sarah Vaughan, and Count Basie; composing the scores of such films as The Pawnbroker, In Cold Blood, In the Heat of the Night, and The Color Purple, and the theme songs for the television shows Ironside, Sanford and Son, and The Cosby Show; producing the bestselling album of all time, Michael Jacksons Thriller, and the bestselling single We Are the World; and producing and arranging his own highly praised albums, including the Grammy Awardwinning Back on the Block, a striking blend of jazz, African, urban, gospel, and hip-hop. His musical achievements, in a career that spans every style of American popular music, have yielded an incredible seventy-seven Grammy nominations, and are matched by his record as a pioneering music executive, film and television producer, tireless social activist, and business entrepreneurone of the most successful black business figures in America. This string of unbroken triumphs in the entertainment industry has been shadowed by a turbulent personal life, a story he shares with eloquence and candor.Q is an impressive self-portrait by one of the master makers of American culture, a complex, many-faceted man with far more than his share of talents and an unparalleled vision, as well as some entirely human flaws. It also features vivid testimony from key witnesses to his journeyfamily, friends, and musical and business associates. His life encompasses an astonishing cast of show business giants, and provides the raw material for one of the great African American success stories of this century.